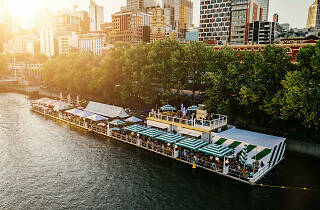 For a New Year’s Eve party with a twist, head down to Arbory Afloat for a night of food, drinks and entertainment on the Yarra River. 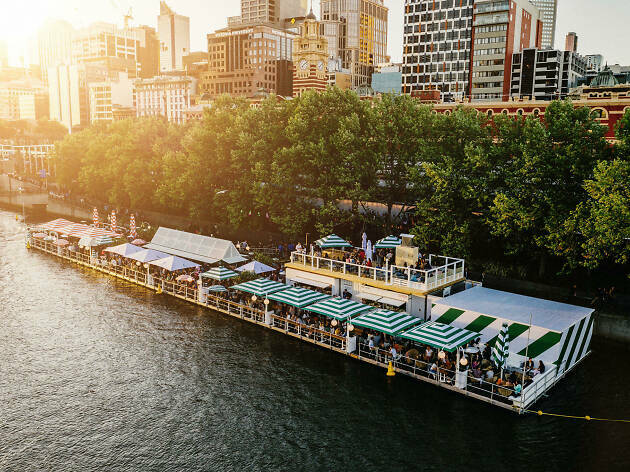 While the rest of Melbourne is partying in clubs, pubs and on rooftops, you’ll be one of the few able to say hello to 2019 on the Yarra River itself. Docked at the lower Yarra River landing just a five-minute walk from Flinders Street Station, Arbory Afloat is the party you didn’t know you needed. Your ticket on board includes food, drink, entertainment and a fantastic view of the fireworks. Quench your thirst with free-flowing Champagne and Grey Goose cocktails all night, plus a choice of tap beers, premium house spirits, red and white wines and cider. New Year’s Eve might be all about the drinks, but at Arbory Afloat the food demands just as much attention. Executive chef Nick Bennett has produced a menu that truly tastes like the Amalfi coast: think canapés like arancini and croquettes, A-grade woodfired pizzas, Italian doughnuts for something sweet and (*drumroll*) an oyster bar. Rocking the boat will be a series of DJs and roving performers performing 'Aviary at Arbory', plus your very special host, drag superstar Karen from Finance. Dance the night away right under the fireworks to tunes by Edd Disher, Simon TK, Andy Hart (Wax'o Paradiso), Collette and Pjenné, and you can also enjoy eye-catching performances from the likes of the Huxleys, Simone P Jones, Holly Durant, Gabi Barton, Benjamin Hancock and James Andrew. Doors open at 7pm, with the food and drink package kicking off at 8pm. General release tickets including all of the above are on sale now for $210.